Centrally located in the heart of St. George, this Department of Transportation operated Municipal parking lot is conveniently positioned near many St. George attractions and government buildings, including the Staten Island Ferry, Richmond County Ballpark, the Courthouse, and Borough Hall. 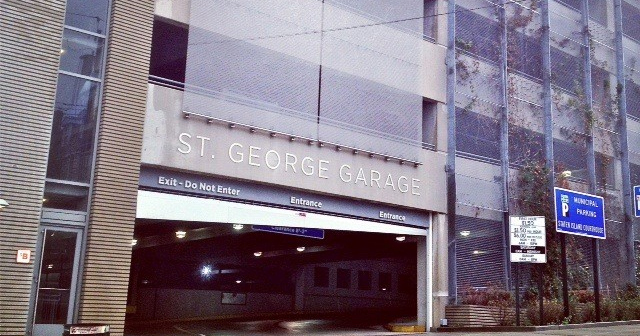 Located at 54 Central Avenue, the parking garage contains 719 spaces, including 35 spaces for people with disabilities. It also includes charging stations for electric vehicles. It is well lit and always manned during hours of operation, which are from 6am-10pm, Monday thru Friday, from 8am-midnight on Saturday, and 8am-8pm Sundays. The rates are: $1.75 for up to one hour, $2.00 for additional hours, with an $8.00 maximum. The special event rate is $7.00. All DOT parking facilities accept credit card payment, NYC Parking Cards and coins. Monthly permits are also available by contacting the garage manager, Parking Systems Plus, at 718-524-1190.